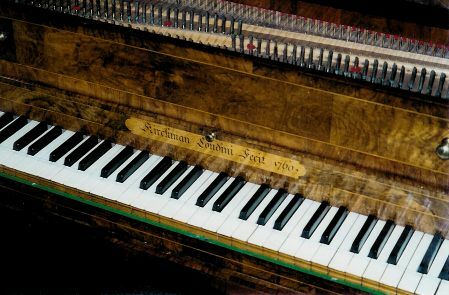 In late 2002, the Curator of the Instruments in the Eileen Joyce Studio, Jillian Belbin, raised concern that the existing corroded tenor strings on the Kirckman harpsichord gave a very dull and muffled tone. It was proposed to see what improvement might be gained during the next annual maintenance visit to Perth (December 2003) by restringing that region of the instrument with Malcolm Rose soft iron wire. As well as the corrosion, the diameter of the existing tenor strings was found to be rather thin. The corroded iron strings on the 8⁠´ choirs from the tenor up were replaced using Malcolm Rose soft iron wire. The replacement was continued one course higher into the brighter wire which was probably of different manufacture or batch. The displaced strings were enveloped and retained on site. 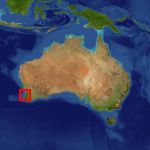 No gauge numbers were visible on the nuts of the UWA instrument. 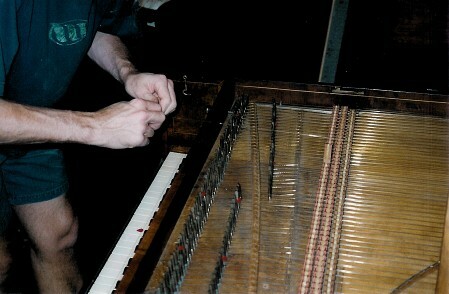 The diameter above the crossover was increased to more what is expected, with reference to the gauge numbers found on a 1762 Kirckman single in private ownership in the UK, as noted in Rose & Law’s book A Handbook of Historical Stringing Practice for Keyboard Instruments (instrument #93). The crossover to brass occurs where expected on the UWA instrument, but with the partial restringing, the diameter of the iron has increased at that point to properly match the denser existing brass. The change of diameter to the next smallest size of iron occurs at c#, where expected, but compared to the reference points on the 1762 Kirckman, to assimilate the newer strings into the existing schedule for the remainder of the compass, the change to .012˝ was made two notes lower, and the change to .011˝ four notes lower, where only a single course was replaced to ease the transition. The original, undrilled tuning pins were retained in order for use in their individual holes in the wrestplank. Two pins required a thin paper shim to bring them to decent height. Several of the pins in the region already had their holes bushed with thick paper, and this arrangement was not disturbed. The original and replacement string sizes for the tenor region are shown in the table opposite. Everyone was pleased with the immediate improvement in tone in the restrung region of the instrument, even allowing for the fact that a few tunings would be required to allow the new soft wire to stretch and begin to bloom. The job was considered a success. It was noted that a number of notes with existing strings in the alto area have annoying whistles and other extraneous noises. As the new wire would reduce or eliminate those distractions, the restringing may be continued in stages on subsequent Perth maintenance visits. Following the success of the tenor restringing in November 2003, it was decided to continue the Malcolm Rose wire higher in 2004. The schedule in the tenor was heavied up to conform with instrument #93, and the Rose wire continued to b' using .011˝. Again, the original, undrilled tuning pins were retained in order for use in their individual holes in the wrestplank. 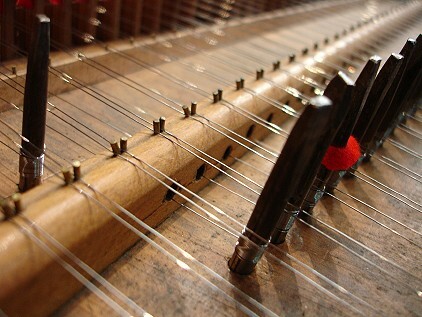 The existing hard steel strings from c'' up were left on the instrument, leaving the upper octave and half of the unison choirs to be restrung on a subsequent visit with .010˝, as well as the 4⁠´. The original and replacement string sizes for the restrung region are shown in the table opposite. It was decided to continue the restringing to complete the iron of the unison choirs, leaving the 4⁠´ for the future. Again, the schedule for instrument #93 was followed, and the Rose wire continued from c'' to the top using .010˝, replacing the existing .009˝ steel. The original, undrilled tuning pins were again kept in order and returned to their original holes in the wrestplank as the stringing progressed. The final stage in the removal of the old steel wire was completed in November 2006, with Rose iron used for the 4⁠´ choir. As instrument #93 in Rose & Law did not have a 4⁠´ choir, the schedule for instrument #96 was used as a guide. The Rose iron wire was used from G (.014˝) to the top (.009˝). The original, undrilled tuning pins were again kept in order and returned to their original holes in the wrestplank as the stringing progressed. The 4⁠´ choir is particularly fiddly from the tenor up, as the strings must be run through tunnels in the 8⁠´ nut to reach the 4⁠´ tuning pins closer to the player. The bass strings of the unison choirs were replaced with Malcolm Rose yellow brass in November 2007, and the progressive restringing finally completed in November 2008 with the replacement of the 4’ bass strings, also with Rose yellow brass.